In June of this year I took a trip with my Dad to Toronto and New York City. I knew ahead of time that we would be traveling on Father’s Day, so I made a gift to present to him on the trip – a handmade journal for him to write in each day, which he did. 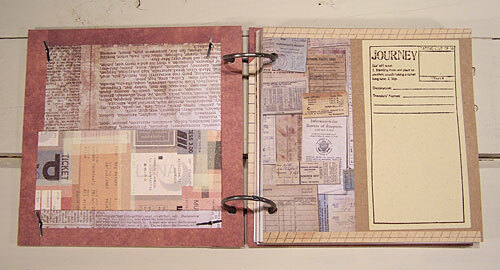 The journal was designed so that after the trip we could add photos and ephemera and perhaps write more about our memories. I’m in the process of getting both of our photos printed so we can start working on it. I expect this will be a long term project and we will enjoy the time together that we spend on it and memories of the great trip we had. Below are photos of some of my favorite parts of the journal, as they looked before any content was added. In the future I’ll be sharing some our favorite layouts as we get them done. Here is the front cover of the journal. 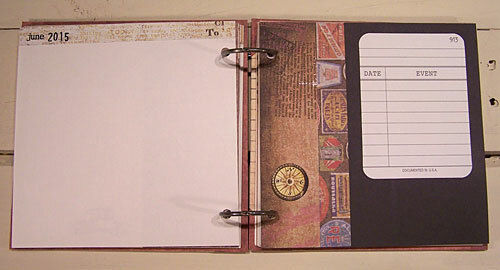 It’s decorated with a collage that is protected by a piece of acetate. The small word rubber stamps are from Carolyn’s Stamp Store. Inside front cover and first page. The inside front cover has a pocket for holding ephemera. The large rubber stamp on the right is from 7gypsies. On the left I used a trimmed Project Life card, part of the collage I made and some decorative paper. The small rubber stamps on the right are from Carolyn’s Stamp Store. On the left I used two different stencils from Crafter’s Workshop and a stamp from 7gypsies. 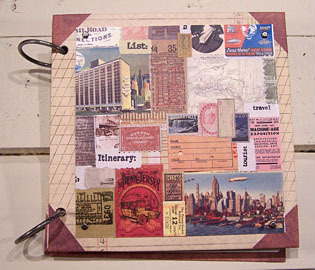 On the left I used a Project Life card, part of my collage and decorative paper. On the right are stamps from Carolyn’s Stamp Store. On the right I used a stencil from Crafter’s Workshop and some decorative papers. 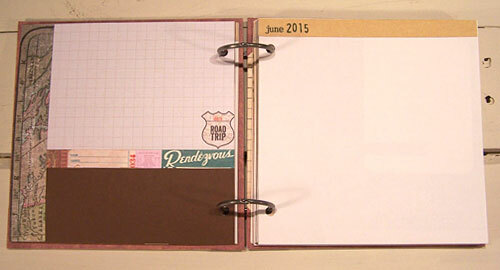 On the right in addition to decorative papers I used a sticker from Tim Holtz and a Project Life card. 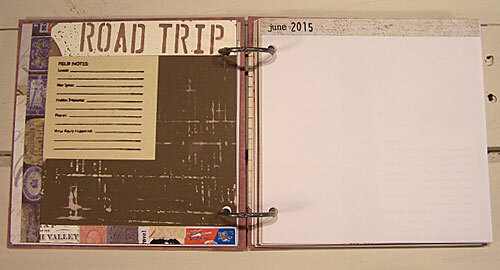 In my tutorial “Scrapbooking My Way on the Highway” I explained why I chose an 8.5 x 11 inch page format for my Route 66 scrapbooks and described how 3-ring binders help me to arrange my photographs by geographic order rather than time order. 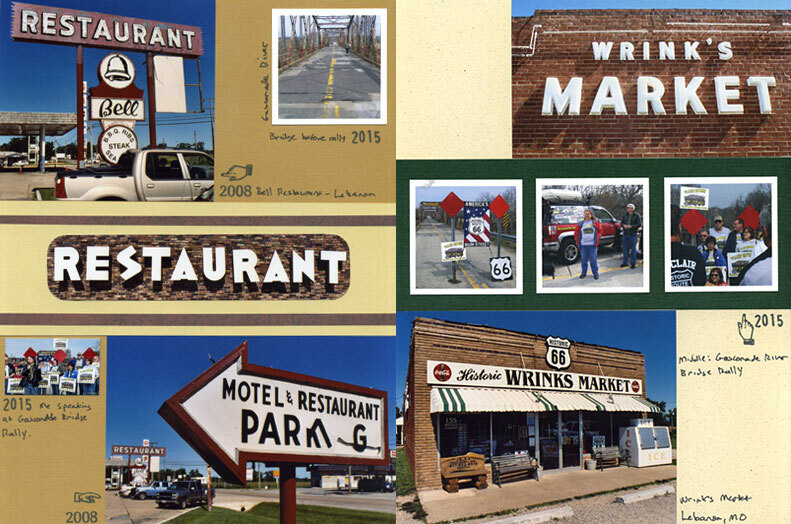 I’ve taken a lot of Route 66 trips and plan to do more in the future, so I like to be able to insert pages from the same area next to pages from an earlier trip. This practice helps me to learn the geography of the road and to document how it changes over time. 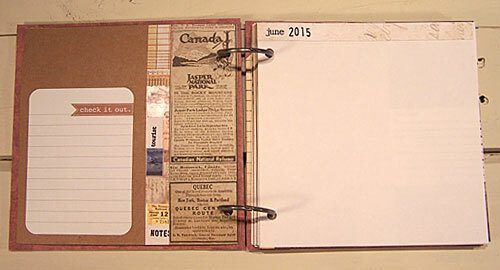 When you mount standard-sized photos on an 8.5 x 11 inch page, you are left with a lot of empty areas to fill. This is not necessarily a bad thing because as a result there is ample room on the pages for journaling and small ephemera. Lately I’ve been experimenting with another way to fill those empty spots – with small photos. There are online companies that specialize in printing 2 x 2 inch photos from your social media accounts. I decided to try out the services of Social Print Studio to see how such photos look in my existing albums. 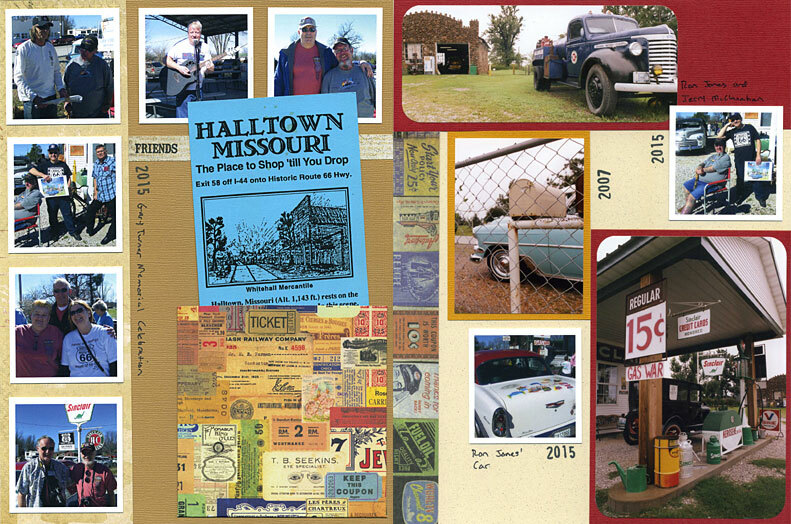 In the image at the top of this article, I have mixed the white-bordered 2 x 2 prints from Social Print Studio with standard sized-photos on two scrapbook pages that show places and events in the Lebanon, Missouri area. I’m really happy with the results – these small photos really help me use the space more efficiently and the white borders look terrific on colored cardstock. I also tried using Photoshop to make montages of photos for printing in a 4 x 6 format. This is a great way to print photos from social media that are not of a high enough resolution to print in a standard size. The tiny photo at the lower left was taken from Facebook. Yes it’s small but it’s better than not having it at all! This is a great way to obtain a bunch of small photos to fill in gaps for a very reasonable price! Just cut the montage prints apart and fit the tiny photos in among the larger photos. 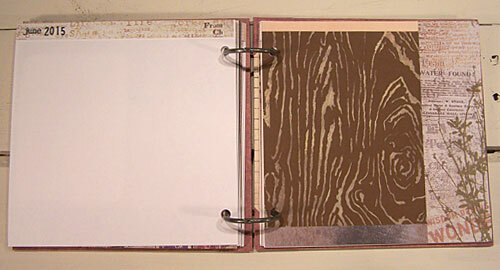 The image below shows two more pages that utilize the 2 x 2 photos from Social Print Studio. I like to mix emphemera in my albums and I have a lot of brochures and brochure-sized items displayed in pockets. On an 8 x 11 inch page, after I install the pocket there is no room for a standard sized photo but as you can see there is room for 6 small photos! If you are interested in the rubber stamps I used on my pages, here is a link to the year number stamps and the tiny hand stamps come from sets from my faux postage collection. The word “Friends” comes from the stamp set Photo Caption Word Stamps for Road Trips which was designed with road trip scrapping in mind!